Extreme Geekery: Water, Water, Everywhere, How Much Is There To Drink? Recently, I read an article stating that California – in an attempt to alleviate their water shortage – was instituting "toilet to tap" procedures. That is to say that water flushed from people’s toilets would be treated and put back into the system for use as drinking water. While the immediate reaction tends to be a big "Yuck! ", this isn’t actually too bad. Water from toilets, showers, and other sources of waste aren’t routed straight to the tap, of course. First, it is treated, filtered, purified, and otherwise made totally safe for human consumption. In fact, we’ve been engaging in a large version of "toilet to tap" for quite some time. Waste water doesn’t simply vanish. Waste products are consumed by bacteria and other organisms. The water passes through soil and gravel, is evaporated and precipitated, and winds a long path back into our drinking supply. This is simply taking a short cut using technology. This led me to wonder, though. Suppose we dumped all of the water we used into some secure container marked "Do Not Drink – EVER". Instead, we provided every human being with new water to drink every day. For the purposes of this discussion, we’ll ignore all other uses for water. Only drinking is allowed. No watering crops, showering, or washing your car. Just drink the water and dump it when our bodies are done with it. We’re also going to assume that the human population remains constant. No big spikes or drops in the number of humans on this planet. First, some facts: The world has 326 million cubic miles of water. This equals 1.36 x 1021 liters. There are 7.125 billion people on the Earth now. The average human needs 75 to 150 ounces of water a day. Obviously, each person would need a different amount of water depending on age, gender, the climate they lived in, etc., but let’s take the average of that daily water requirement and say that each human would need 97.5 ounces per day. That’s 2.9 liters of water per person per day. If you work out the math, this results in 65.8 billion days worth of water or 1.8 billion years. That’s quite a lot of time until we run out of water. Around 1.8 billion years ago, the first multi-cellular life was forming. Even if humans somehow survived for the next nearly two billion years, I doubt we’d look the same as we do today. There’s one little flaw in my math, though. Of that 326 million cubic miles of water, only a small fraction can actually be drank. Only 4% of the Earth’s water is fresh water. Of that, 31% isn’t locked away in glaciers and icebergs. Yes, we could desalinate sea water or melt icebergs, but that adds difficulty and expense. So let’s just take the remaining fresh water and use up that before going after the rest. That means we have 1.69 x 1019 liters. That amount of water would last us 816 million days or 2.2 million years. No, it’s not the billions of years before, but it spans a time from around the first use of stone tools to the present day. Getting back (slightly) to real world situations, what if we didn’t simply limit water use to drinking. Let’s let everyone bathe (thank goodness! ), clean dishes, flush toilets, etc. The average person uses between 80 and 100 gallons of water per day. If we assume 90 gallons (340.7 liters) of water per day then, using just the fresh water again, there would be enough water to last for just under 7 million days or 19,000 years. This might still seem like forever – after all it is the difference between the era of cave paintings and the era of smartphones, but it’s a blink in the geologic sense. 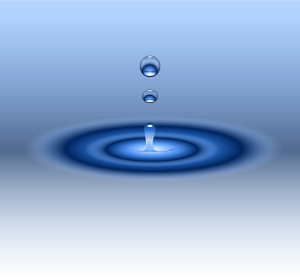 NOTE: The "water drop" image above is by Keistutis and is available via OpenClipArt.org.